Take on the heroic challenge of freeing and restoring beautiful lands from invaders. 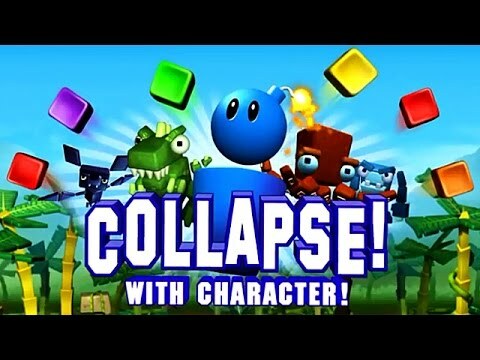 "If you've ever played the earlier versions of Collapse, you will adore this game. It's as fun as Bejeweled or any other Match 3 games. My family loves challenging each other with the levels, and the customizations are cute. This game never gets old!" Take on the heroic challenge of freeing and restoring beautiful lands from invaders. Travel a huge new world with over 180 invigorating levels and go up against mighty enemies like Blockzilla, Block Widow and Blocktopus using your own customizable character. Use explosive power-ups, earn money for powerful upgrades, and win special character costumes for extra fun. The blockbusting, color-matching excitement of COLLAPSE has returned.